I know. It’s been a long time no blog. I’ve been busy eco-dying. Sooooo much fun. Successes. Failures. Surprises. Love it. 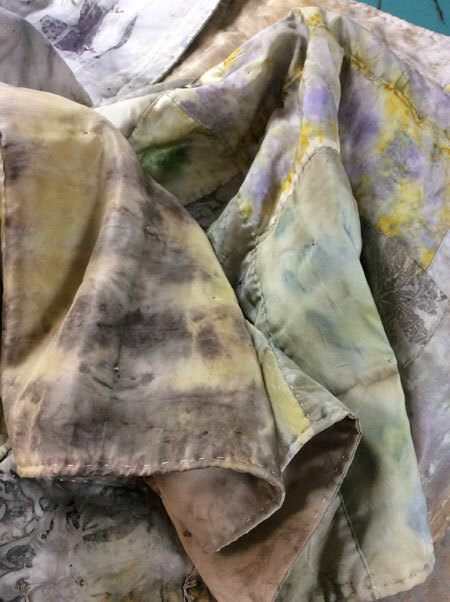 Here is an entirely eco-dyed quilt of many samples. Hand quilted and tied. Tried to machine quilt it but lost all the lovely puffiness that only silk seems to avail. This entry was posted on September 14, 2015 at 10:20 am09 and is filed under basket, birds. You can subscribe via RSS 2.0 feed to this post's comments.